As described in my last post, this scenario set an 'allied army' of Russians and British against a French division commanded by Marshal Ney. 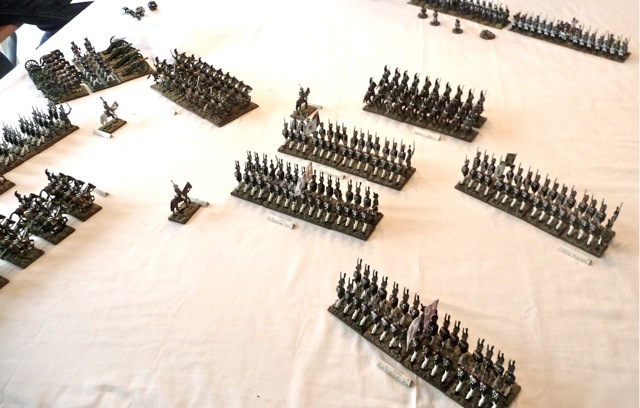 The game started with the British deployed in one corner of the table to which they had to move across the long length and exit the other side. 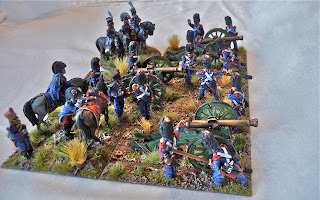 They were composed of four highly trained infantry battalions, a battery of Royal Horse Artillery, two sections of rocket artillery and two squadrons of Light Dragoons. The Russians were deployed opposite of the British with a mixed division of two brigades of four battalions each, two Dragoon regiments a regiment of Cuirassiers and a large battery of guns. They had solid troops but were hampered with a clumsy command structure that lacked flexibility. The French entered along the long side opposite the separated Anglo-Russo force. It had two brigades of four battalions each, a brigade of cavalry composed of a Dragoon regiment, and a Carabinier regiment. It also had two batteries of foot artillery at its disposal. This was to typify a classic division of the Grande Armee at the height of it's powers. It was ably led and had some very good units. In probably should have made it even more stronger but I did not want it to be too overpowered. For rules we used 'Food for Powder' which we've been developing over the past year. 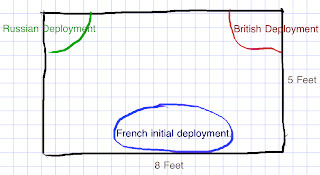 The French (Sylvain and Bob) started by advancing into a central position in which to both block the Russians while concentrating on the British. 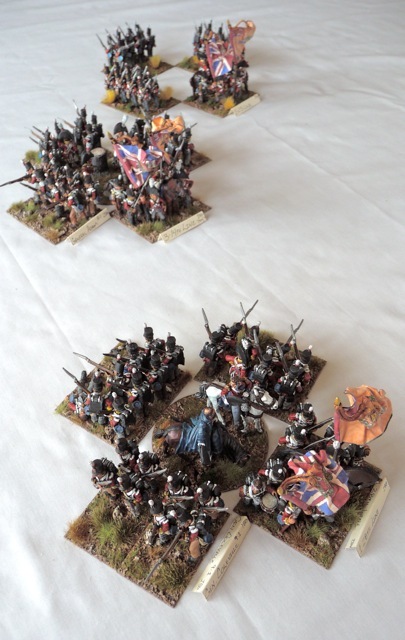 The British (Stacy) started to begin their infantry on their trek across the table while their horse artillery deployed and the Light Dragoons shook-out of column into line to better screen the force. The Russians (John and Chad) began to deploy both their infantry and cavalry into supporting lines, and moved their guns into a position in which to unlimber. The Russians begin to deploy and move forward. The French line is in the distance. The French formally 'opened the ball' by quickly advancing their Dragoons across their front and initiated a charge on the British position. 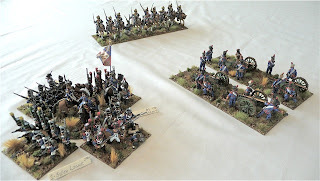 (This was particularly exciting for us as it provided a real acid test for our cavalry rules.) 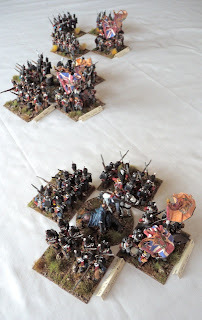 In reaction, a couple of the English units, caught in either skirmish formation or line, panicked and fell back while the others crashed into squares (the British Dragoons were too busy on the opposite flank to properly react to this event). The French Dragoons, satisfied with the ensuing chaos, decided not to charge home and instead pulled-up to act as a blocking force in order to keep the English creeping along in their squares. 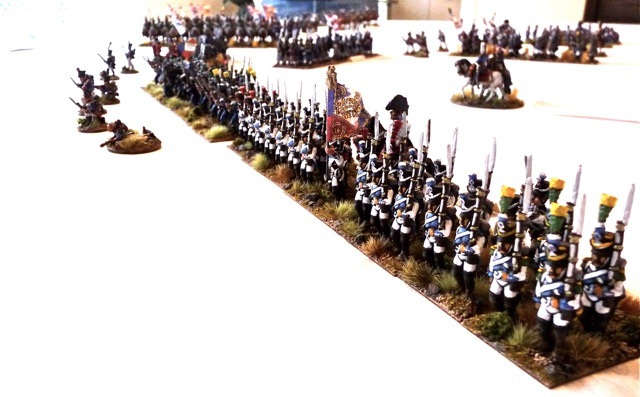 As the French Dragoons approach the Rifles are compelled to inelegantly scamper back along with another British battalion. 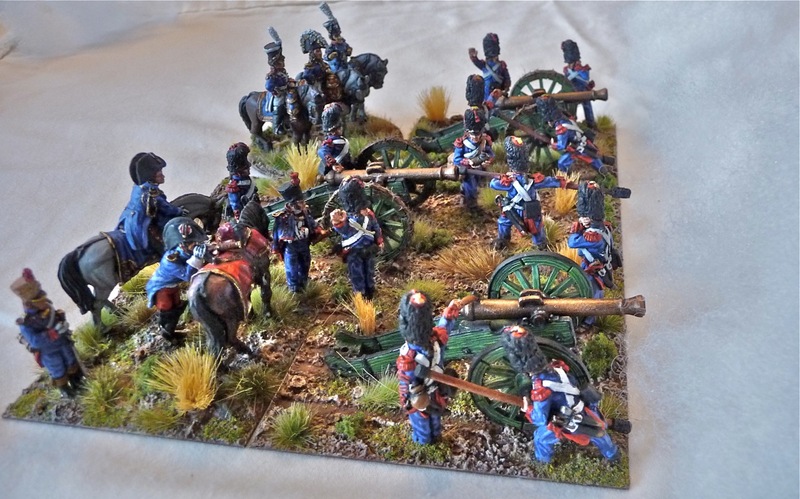 The British also feared a battery of French 8prds rolling near to their position and the Light Dragoons charged to take advantage of the fact that the guns were still limbered. Lucky for the French gunners a supporting unit of infantry reacted by forming square and they managed to abandon their guns and dash to its safety. The British cavalry contented themselves by cutting gun traces and laming the limber teams (cruel brutes) so as to limit the battery's further movement. Two squadrons of British Light Dragoons charge a limbered French artillery battery (whose gunners had to dash to a nearby square). On the French left flank the Carabiniers began their approach to order to charge a Russian infantry brigade. A Russian Dragoon regiment reacted to interdict with a counter-charge. The French Carabiniers duly diverted themselves to meet this new threat and a wild melee ensued. 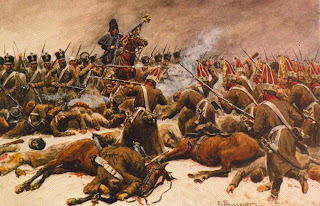 The quality and size of the French heavies overwhelmed the Russian Dragoons who were dispersed. 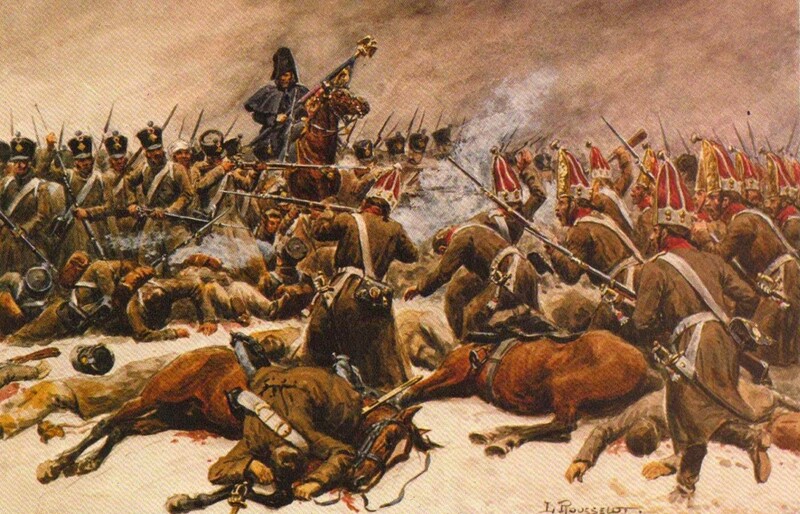 The victorious Carabinieres, while partially blown, and taking musket fire on their flank decided to make hay while they could and continued their charge into a supporting regiment of Russian Dragoons. The Russians lost their bottle and recoiled through several ranks of infantry causing general havoc to all. The French cavalry, completely blown by this point (in our system cavalry accrue cumulative 'disorders' in both the act of charging and in the melee itself), decided to pull-up in preparation of extracting themselves. At around this time the Russian heavy artillery dropped their trails and began their extended cannonade on the French center. This battery of eight guns would have a telling impact as they effectively mauled two French battalions over the course of the battle. While the British brigade crept along in square its cavalry was doing sterling work in keeping the opposing French brigade on it's back foot. The Light Dragoons charged another battalion which was caught out and so were effectively run-down. 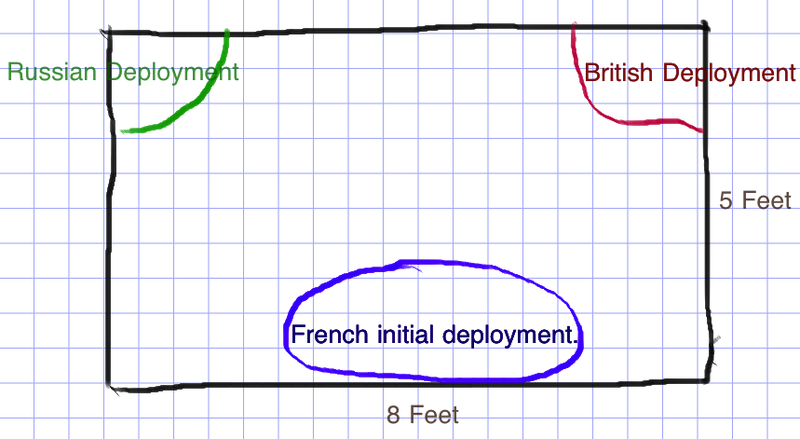 Seeing the British cavalry drawn away the French battalion that was in square (along with the gunners who were taking refuge in its ranks) deployed back into line and began to move up towards the British main line. Unfortunately, this unit would be surprised by the returning British cavalry and ultimately dispersed. This particularly hurt the French as they also lost the gunners with this battalion which effectively silenced their guns on that flank. 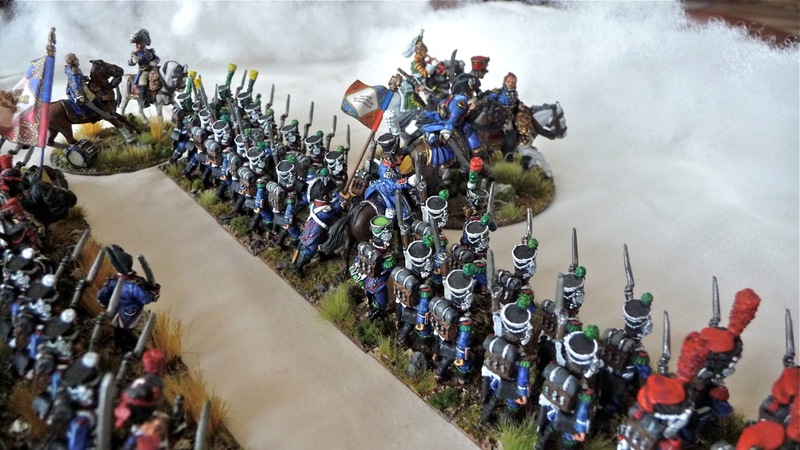 The Carabiniers, blown and bloodied from their efforts, were finally forced to withdraw and lick their wounds due to the massing Russian infantry and their galling musketry fire. Nonetheless, a French 12 pdr battery had now deployed and was beginning to extract a fearsome toll from the Russians converging on the French left flank. At this point Ney felt he had to take matters into his own hands and so took command of the infantry brigade on the left flank for a general assault. He personally led a veteran Legere battalion which then closely engaged a Russian Grenadier battalion. The Russian battalion held from the intitial onslaught but were overwhelmed when Ney stepped to the front, amongst the smoke and fire, to invigorate the French efforts. The Russian brigade recoiled from the assault but they had another brigade in support whereas the French, who also were ultimately compelled to fall back from their losses, had no reserve. To make matters worse for the French they discovered that Ney had been mortally wounded while leading the assault and was being carried to the rear. With the French center collapsing, and their beloved Marshal down, the French consolidated and began to withdraw under the coming nightfall. The British would have to make their excuses to the Russians for their unannounced appearance (and act of belligerence to the Danes) but they would ultimately be able to withdraw to their ships. The Russians would be delighted upon hearing of the removal of one of Napoleon's most successful Marshals and so would consider the action a pointed victory. We had a great time with the scenario, with the guys particularly enjoying the cavalry actions and Ney's fateful assault. The rules worked quite well on the whole but will benefit from the comments and suggestions that I received from all the players.